In the only video below featuring Pastor Paul Begley interviewing Steve Quayle, Quayle immediately tells us that artificial intelligence is now advancing so fast and furiously, it's almost impossible to keep up with the advances with new headline stories emerging every day. 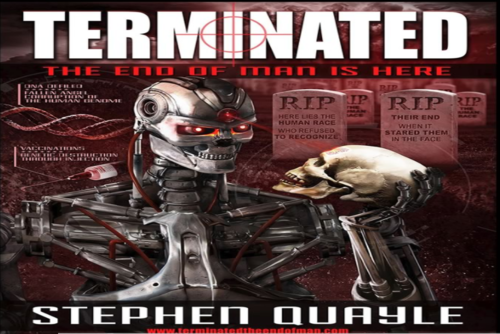 Speaking with us about his just released book, "Terminated: The End Of Man Is Here", Quayle re-emphasize's the warning seen on the book cover: "Here lies the human race who refused to recognize their end when it stared them in the face". Referring to A.I. as 'anti-christ intelligence', Quayle warns us that the road we're on, with A.I. being 'packaged' to the masses dressed in pretty bows, will surely lead to our destruction. And while the masses aren't quite yet seeing what Quayle, Elon Musk and others are warning about, as Hacker Noon reports in this new story that Zero Hedge republished on their website a few days ago, the creation of dystopia that is now unfolding before our eyes is one of the gravest threats that humanity faces. As Search Enterprise AI recently reported, the risks of A.I. continue to grow the more pervasive the technology becomes and what most people aren't yet seeing is the fact that once A.I. becomes completely autonomous, what human beings want from A.I. will no longer matter as 'it' will be making decisions based upon the needs of A.I., not the needs nor wants nor at the direction of human beings. And with many globalists actually believing that A.I. and 'transhumanism' combined will allow them to 'become Gods' and 'live forever', the future unfolding before us will look unlike anything we've seen yet in the past. In just two months from September 14th to September 16th, Steve Quayle will be joined by Tom Horn from Skywatch TV, Timothy Alberino, David Knight from Infowars and several others for Gen Six's True Legends Conference to discuss that future in "Transhumanism and the Hybrid Age". And while not everybody will be able to make it out to Branson, Missouri to see them live, you can purchase a live streaming ticket right here. As Quayle warns us in this video, the global elite who look down upon us all really believe that these emerging and rapidly growing technologies will give them 'superpowers' like comic book super heroes. And with the acquisition of such powers making them believe in their own warped minds that they'll be that much more superior to us, Pastor Begley warns that with the marriage between A.I. and transhumanism, we're really now witnessing the full implementation of the 'beast system' with 'demon-possessed' machines surely our new reality. Called 'techno-possession' by Quayle, as one observant person commented on their video, "everything is coming out of the closet, Giants, transhumanism, UFO, alien the whole lot. It's like a smorgasbord of the strange and bizarre and everything in between." With Pastor Begley warning us that Satan is now using every technological tool that the human race has developed to accomplish his evil work, he also warns that this 'technological new world order' that we've suddenly been cast into has been carefully crafted by the globalists for decades with Quayle calling it 'the borg'. 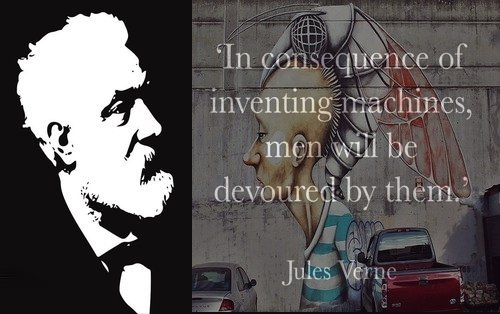 Bringing up the Jules Verne quote "In consequence of inventing machines, men will be devoured by them", the 'brave new world' that the globalists have been constructing will be managed by the machines we've created. With dozens of different nations also now launching an A.I. arms race, we shouldn't be the least bit surprised that A.I. is being created to take human lives and as Quayle told Greg Hunter from USA Watchdog back in June, in the future, robots will have one prime directive: "kill all human beings". As The Conversation reported in this July of 2017 story, while 'the elite' and transhumanists blindly follow the quest for 'super-intelligence' and 'eternal life' into the future, they're clearly ignoring the 'dark side' of such technologies such as the possibility of their 'transhuman selves' being 'brain hacked', leaving them completely controlled. Echoing a scene from the science fiction TV show "Continuum" where a future 'super soldier' is 'hacked' and forced to kill an innocent man who had been working for the government who hacked her, it's very obvious to those paying attention that the potential for abuse of these emerging technologies will continue to grow as more and more of these so-called 'new technological advances' are rolled out. As Quayle tells Pastor Begley, we are now at the point in time with the quickening of time, the emerging technologies and the emerging global government that Jesus warned us of long ago: "If those days had not been cut short, no one would survive, but for the sake of the elect those days will be shortened."